Jack Berninger wasn’t even supposed to be there. They were Jennings Culley’s tickets – airfare for two to Phoenix for the 1986 Associated Press Sports Editors summer conference. But Culley, The Richmond News Leader’s sports editor at the time, couldn’t go. Somethi ng came up. So Berninger, The News Leader’s assistant sports editor at the time, got Culley’s ticket and then bought his wife’s ticket. “And we hopped a flight to Phoenix,” Berninger said. No name change. No transfer fee. No security hassles. “You couldn’t do that today,” he laughed. That was Berninger’s first-ever APSE event. He was instantly hooked. 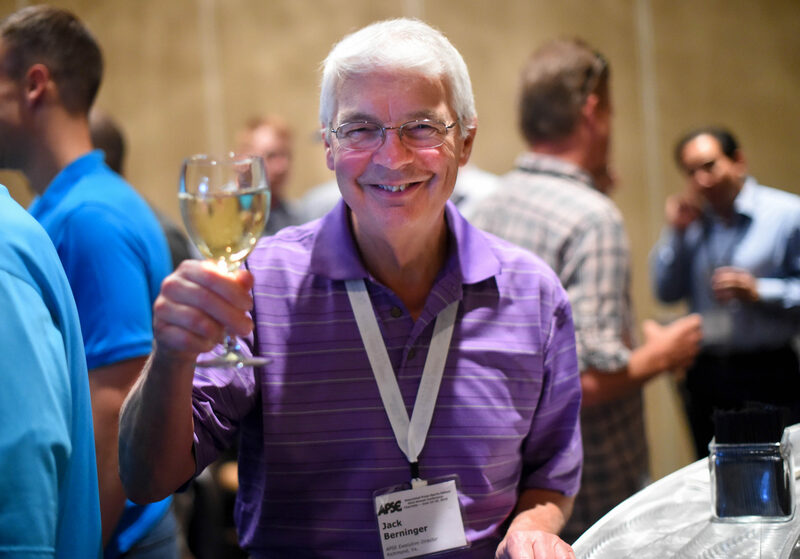 Over the next 31 years, including the past 11 as the APSE’s secretary treasurer and then executive director (convention coordinator), the list of friends Berninger has been able to assemble is innumerable. When this year’s summer conference convenes in New Orleans, most of those friends will be there to toast Berninger’s retirement from his APSE post. This will be his last conference as organization’s convention coordinator, having already retired from his role as treasurer. When The News Leader, an afternoon paper, merged with the Richmond Times-Dispatch, a morning paper, in 1992, Berninger was named associate sports editor under then-RTD sports editor Howard Owen. It was Owen who would teach Berninger the intricacies of an “a.m.” paper, and the two laid the ground work for bringing the APSE national convention to Richmond in 1998. That’s when he approached Times-Dispatch executive editor Bill Millsaps about it. Next thing Berninger knew, there was a check for $12,500 to host the APSE conference in the River City. Berninger played a big role in that conference, foreshadowing his future role in the organization. Berninger retired from the Richmond Times-Dispatch in May 2006 after nearly 37 years in the business. In June of that year, he became the APSE’s secretary treasurer after the convention in Las Vegas. A year later, after convention coordinator Herb Stutz retired, APSE combined the roles of secretary treasurer and convention coordinator. And Berninger was the man for the job. Millsaps believes it was because there wasn’t anyone better. Berninger does leave an enormous footprint in the APSE, not only as the convention coordinator – and the hospitality room hero – but also as the organization’s money man. Especially during the recession. It was juggling all of those things that fulfilled Berninger and helped guide the APSE through some rough waters. “The ultimate thing was the convention – APSE’s ultimate item is the conference,” Berninger said. “All I wanted to do was keep things straight and not lose money. “We’ve had great years and several years – during the recession – we were lucky to escape the hotel (with a minimal loss). Having to keep track of hundreds of members, two conferences (summer and winter) and all the dues, money and issues that come up in a never-know-what-the-next-day-will-bring business, Berninger relied on his organizational skills to keep everything straight. It’s those organizational skills that stood out to Millsaps when he hired Berninger to lead the Richmond Times-Dispatch’s sports department. “I did not post the job, I did not ask others to apply,” Millsaps said. “I wanted Jack. Period. That’s all. Berninger laughed when asked about his skills at keeping everything organized. “If you saw my office at the house, it’s awful,” he said. “But I know where everything is. Berninger used to go through 25 legal pads a year when he was a sports editor, keeping up with notes and schedules. His methods didn’t change much as the APSE’s executive director. “If you aren’t organized, the job’s going to be tough,” he said. But that’s not the only reason Berninger was so important to APSE, said Ahern. “Jack is so much more than just the financial backbone of the organization,” he said. “He’s been the keeper of the integrity and the values of APSE. Berninger hasn’t done the job alone, as anyone who’s been to a summer conference knows. He’s had his wife, Colleen, by his side from the beginning. Colleen owns the registration desk, getting members and their guests signed up and equipped with everything they’ll need for the convention. This year will be her 11th consecutive year running the desk, serving as the APSE’s greeter, problem solver and concierge. From his first convention as conference coordinator, Berninger knew his wife would have to play a vital role. The husband-and-wife team is something Ahern will always remember. Colleen not only holds her own at the registration desk, Mrs. Berninger can do so at the bar as well. During the Boston convention in 2011, Berninger and his wife went out to dinner with Globe sports editor Joe Sullivan and the Minnesota Star Tribune’s Glen Crevier. After a fine dinner, complete with a “few glasses of wine,” the group headed to the bar. “We came back and each of the guys ordered a limoncello,” Berninger recalled. That was one of Berninger’s favorite moments from his time in APSE, but not his only one. Some of his memorable moments are recognizable by other attendees during particular conferences, like the time he brought the APSE to his hometown of Richmond in 1998. Or the convention in Minneapolis when “someone” went out to make a beer run late at night, completely mangling a security gate that separated the hotel from the mall it was attached to. “The hotel people came to me the next day. They had pictures of it,” Berninger said. “I about, well, I about passed out. True to his character, Berninger declined to name that someone. Other memories are ones that only he might reflect on and smile. “I have loved doing this … It’s been fun. It was not a chore,” Berninger said. “At times, there were some lows, when people didn’t cooperate getting information to me. But you forget that. This year on the final night in New Orleans, it stands to reason Berninger can have one last glass of wine in hand with Colleen by his side, and know he served this organization well.